Google+ is taking on Pinterest with its new feature, Collections. Google+ has users’ best interests at heart with Collections. The social media network developed it to allow users and brands alike to create online boards of images, videos, and other content that all relate to certain interests and topics. Similar to Pinterest, these boards become organized “collections” of content that can be can be shared publicly, privately, or with a select set of people. Users can also follow the public collections of others that interest them. Brands and businesses can take full advantage of this new feature as well, creating topic-based boards to showcase their products, services, and industry news. TheVerge.com posted more to show how Google+ has gotten on board with this popular online pastime. Collections closely resembles a regular Google+ page, but one that’s focused on a specific topic instead of a person or brand. Once users have created their first collection, a new tab will appear on their profiles or pages, which lets others view their public collections. And when users follow the public collections of others, news of new posts in those collections will appear in the user’s stream with a link to easily go view those collections, as well as see similar content from that user. 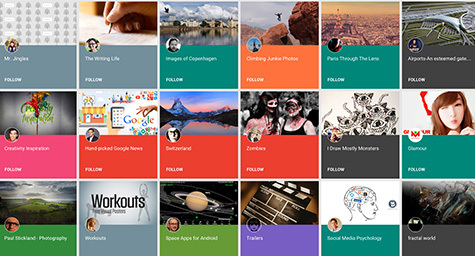 Google+ Collections let users get inspired and informed by the boards of others that pique their personal interest. These boards allow users to share their ideas and interests in a visually enticing way to enlighten, entertain, and educate others. These visual boards are also an outstanding resource for discovering new products and services, which is why they’ve become just as popular for companies as for consumers. They serve as visual virtual catalogs by letting brands display their offerings to a targeted market of people who want to discover new things in their signature style. With Google+ Collections, users can simply find more of the things they love. Collections is currently available on Android and the Web, with iOS support coming in the near future. See what’s new in social media. Contact MDG Advertising.